Taryn Morrissey, American University – Child Care Costs in the U.S.
Child care in the U.S. can cost more than college tuition. 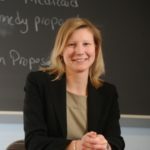 Taryn Morrissey, associate professor in the school of public affairs at American University, explores how to make child care affordable. ​​Taryn Morrissey is Associate Professor of Public Policy in the School of Public Affairs at American University. Her work focuses on examining and improving public policies for vulnerable children, including early care and education, nutrition assistance, and public health policies. She is a non-resident fellow at the Urban Institute and author of Cradle to Kindergarten: A new plan to combat inequality (Russell Sage, 2017). Ongoing research investigates the effects of family economic instability, neighborhood poverty, and state paid family leave programs on children’s health and achievement. From 2013 to 2015, Dr. Morrissey was Senior Advisor in Human Services Policy in the Office of the Assistant Secretary for Planning and Evaluation (ASPE) at the U.S. Department of Health and Human Services. She worked primarily on President Obama’s Early Learning Initiative, including Early Head Start and child care. From 2008 to 2010, Dr. Morrissey served as Health Policy Advisor on the staff of the U.S. Senate Health, Education, Labor and Pensions (HELP) Committee, first for Chairman Edward Kennedy and then Chairman Tom Harkin, where she worked on the Affordable Care Act (ACA) and other public health issues. She began her career in policy as a Society for Research in Child Development (SRCD) / American Association for the Advancement of Science (AAAS) Congressional Fellow. She received her Ph.D. in Developmental Psychology from Cornell University, and her B.S. from Tufts University. Child Care Costs in the U.S. High-quality child care in America is expensive and out of reach for many families. The average cost of child care nationally exceeds US$8,600 per year – more than double the estimated average net tuition and fee price of $4,140 paid by full-time in-state students at public four-year colleges. Both parents and child care providers are “squeezed” when it comes to child care expenses. Families with children aged 5 years or younger spend an average of 10 percent of their income on child care. Yet child care should actually cost more, not less: the median hourly wage for child care workers was only $10.18 in 2016 – less than the median hourly wage of $10.45 for parking lot attendants. This despite the reams of research showing that the most rapid period of learning and brain development takes place during the first three years of life. So what can be done to both improve the quality and increase the affordability of child care? My research recommends a mix of paid parental leave, enhanced child care subsidies, universal preschool and a reimagined Head Start to begin at or before birth. My coauthors and I argue that we need to build on the successes of the states and cities that have created public preschool programs and paid family leave programs. What warrants much greater investment is the gap between age 8 weeks – when parental leave ends – and ages 3 or 4, when preschool begins. The additional $2.9 billion for the Child Care and Development Block Grant program included in the recent budget deal is a great first step for investing in the youngest Americans. States could use these funds to support child care for infants and toddlers, the group for whom care is most expensive and hardest to find. As elected officials debate potential investments in infrastructure, child care should be seen as an essential part of the equation. Do you have more information on how your plan would work for families? Is this plan based on income eligibility – because the middle class is often forgotten.